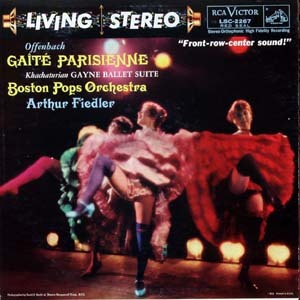 1959 Fiedler Conducts Gaite Parisienne LP, composed by Offenbach and performed by the Ballet Russe de Monte carlo, Gayne Ballet Suite by Khachaturian which includes Lesginka, Dance of the Rose Maidens, Dance of the Kurds and Sabre Dance. RCA Living Stereo LSC-2267. Vinyl lightly used cover near mint. Satisfaction Guaranteed!